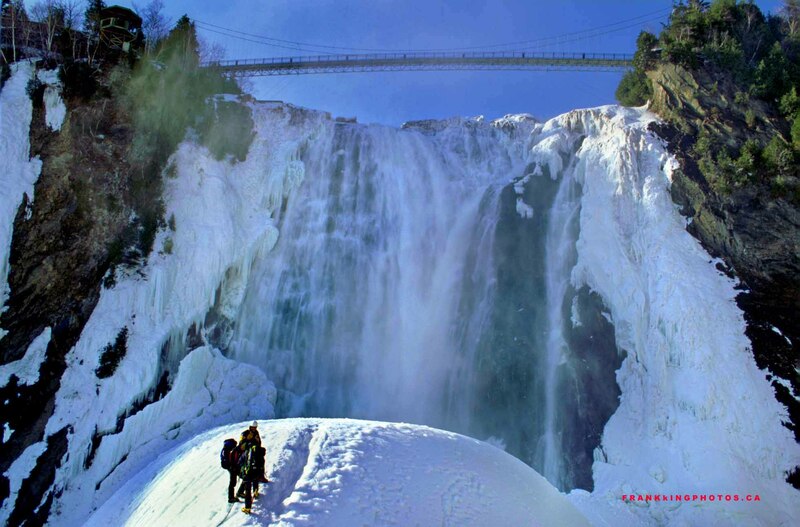 This supremely impressive waterfall, at 84 metres (275 ft.) high and 46 metres (150 ft.) wide, is the highest in the province and 30 metres (98 ft.) higher than Niagara Falls. As you can see, lighting conditions were far from ideal, with the plunging water in the shade and harsh light on the ice/snow mound. A lot of Photoshopping was required to balance the lighting and correct the strange colour cast that happened when the original 2004 slide was transferred to CD. Montmorency, named by famed French explorer Samuel de Champlain in 1613, is part of a larger park that includes key battle areas between the French and British in 1759. Ya, this little area is soaked in history that predates Canadian confederation (in 1867). Nikon FM2 film camera, Velvia slide film, tripod and probably a polarizing filter. A fantastic image Frank. I find I often get a strange colour cast when I scan Transparencies. You’ve done a first class job here in eliminating that.